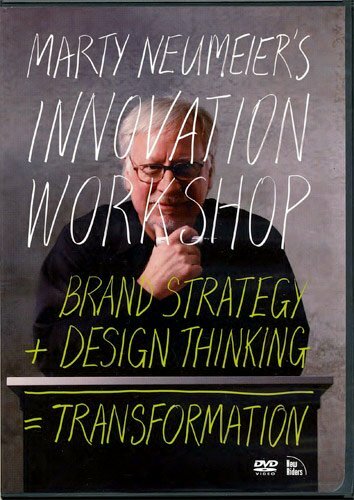 Marty Neumeier is the branding guru behind such companies as Apple, Adobe and Hewlett-Packard. Over the past five years, Neumeier has written three bestsellers on branding and business strategy called “The Brand Gap“, “Zag” and “The Designful Company“. Peachpit Press just released a DVD hosted by Neumeier which takes the concepts behind his three books and turns them into a management workshop. The DVD can be viewed as a 45-minute tutorial or divided into a 1-day workshop with supplied exercises. A CBO (Chief Brand Officer) should have the responsibility to guide a brand, unify the vision/execution of the brand across internal teams and external resources. Your team will need to answer the questions: What passion drives your company? What differentiates your company? Why does your company matter? A Designer is anyone who devises ways to change existing situations into preferred ones. If your company wants to innovate, you need to “design” your future. Neumeier is not talking about designing “poster and toasters”, but reflecting, imagining and prototyping to plan your company’s future growth and innovation. Everyone from the President down can be a “designer” which leads to Part 3. Innovation lies in the gap between company vision and market reality. A tried-and-true response may be comfortable, but innovation has greater rewards. A company needs a mix of short-term goals and long-term goals to stay profitable. Fostering a culture of innovation within the company will delivers sustainable profits and future growth. Everyone within the company should know where the company is headed and why. A big, bold and direct positioning statement can set the tone and focus employees. There are 16-levers to building a Designful Company. Implementing just 3 or 4 can have a big impact within a company. Branding has been a hot topic in advertising and marketing for a number of years. Neumeier is an entertaining lecturer and the DVD is not your standard management psychobabble. Parts 1 & 2 are insightful regarding brand ownership and direction. But, getting management and stakeholders to “buy in” to a company culture will be a challenge even though Microsoft, IBM and Google are great examples of successes. Neumeier is a fast talker and you will want to pause the DVD periodically to catch-up. The DVD also provides some PDF worksheets for the discussed exercises. However, I think the best way to use the DVD is as a companion to Neumeier’s books The Brand Gap and Zag. Part 3 which focuses on his book The Designful Company is rushed, especially regarding the 16-levers.